The shoulder is a ball and socket joint. The shoulder capsule is tissue that surrounds the shoulder joint, supported by ligaments and muscles. The capsule supplies the joint with nutrients and lubricating fluid. It also helps to stabilise the shoulder. Frozen shoulder is the painful and gradual stiffening of the shoulder capsule. This painful stiffening over time leads to sleep disturbance and limits your ability to use your arm in day- to-day activities. It is most common in women than men and people aged 40-70 years. The exact cause of frozen shoulder is unknown. For some reason your body has an over reactive response to a minor injury and tries to heal your shoulder capsule with scar tissue. This leads to pain and stiffness. People with diabetes or history of recent shoulder surgery or recent injury have an increased chance of developing this condition. What happens during each Phase? This can last from 2-9 months. The pain often starts gradually and builds up. It may be felt on the outside of the upper arm and can extend down to the elbow and even into the forearm. It can be present at rest and is worse on movements of the arm. Sleeping is often affected, as lying on it is painful or impossible. During this time movements of the shoulder begin to be reduced. It can last from 4-12 months. 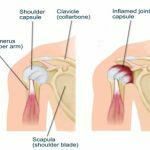 Scar tissue forms around the shoulder joint making movement difficult. At this stage, pain can be more manageable and you are able to sleep better at night. It can last from 5-26 months. The pain and stiffness starts to resolve during this phase, and movements become easier. This happens because your body starts to break down the scar tissue around your shoulder capsule. Physiotherapy treatment ca help to improve and maintain shoulder range of motion. Along with prescribing an individualised exercise program consisting of stretches, strengthening and flexibility. Heat pack x 15-20 minutes to help relieve pain and stiffness.